Richard Karl Freiherr von Weizsäcker listen (help·info) (15 April 1920 – 31 January 2015) was a German politician, and a member of the CDU party. He was President of Germany from 1984 to 1994. In World War II he served in the German Army. He was wounded in East Prussia in 1945 and was sent home to Stuttgart. Then he continued his study of history in Göttingen and eventually studied law. As a law student he was a member of his father's defence team at the Eleventh secondary Nuremburg Trial aka the Ministries Trial. He took his first judicial state exam in 1950, the second in 1953, and in 1955 was promoted doctor juris. In 1953 he married Marianne von Kretschmann; they have four children. From 1967 to 1984 he was a member both of the Synod and the Council of the Evangelical Church in Germany. 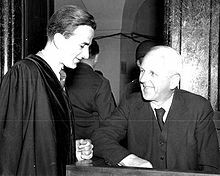 He leaded the German Evangelical Church Assembly from 1964 to 1970. Richard von Weizsäcker joined the CDU in 1954 and was a member of the Bundestag (German Parliament) from 1969 to 1981. He was elected vice president of the Bundestag 1979-1981, but did not stand for re-election, because he became the Governing Mayor (German: Regierender Bürgermeister) of West Berlin (1981-1984). He was elected President of Germany by the Bundesversammlung (Federal Convention) in 1984, succeeding Karl Carstens. He was Germany’s first president after reunification. After his presidency, he was involved in politics and charitable affairs. He was the chair of a commission installed by the then SPD-Bündnis 90/Die Grünen government for reforming the Bundeswehr. He has served on many international commissions. He was chairman of the Independent Working Group on the future of the United Nations and was one of three 'Wise Men' appointed by European Commission President Romano Prodi to consider the future of the European Union. He retired in 1994 and lived in Berlin. He wrote books during his retirement. Richard von Weizsäcker died in Berlin, Germany, aged 94. His autobiograghy is called From Weimar to the Wall: My Life in German Politics (1999). ↑ Richard von Weizsäcker. Eine Biographie. Hermann Rudolph. 2010, page 98. Berlin: Rowohlt. ISBN 978-3-87134-667-5. ↑ 2.0 2.1 "Richard von Weizsäcker, 94, Germany's First President After Reunification, Is Dead". The New York Times.com. Retrieved 31 January 2015.